After a couple of decades of working for Fortune 500 companies, I needed a career change. 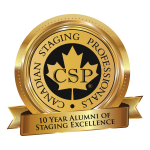 I took the Certified Staging Professional (CSP®) course in September of 2007 and never looked back! 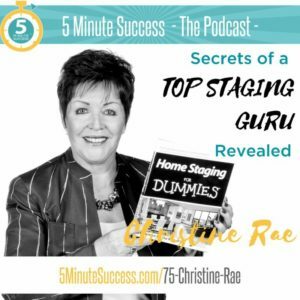 The course gave me the tools to start, develop and grow my staging business. 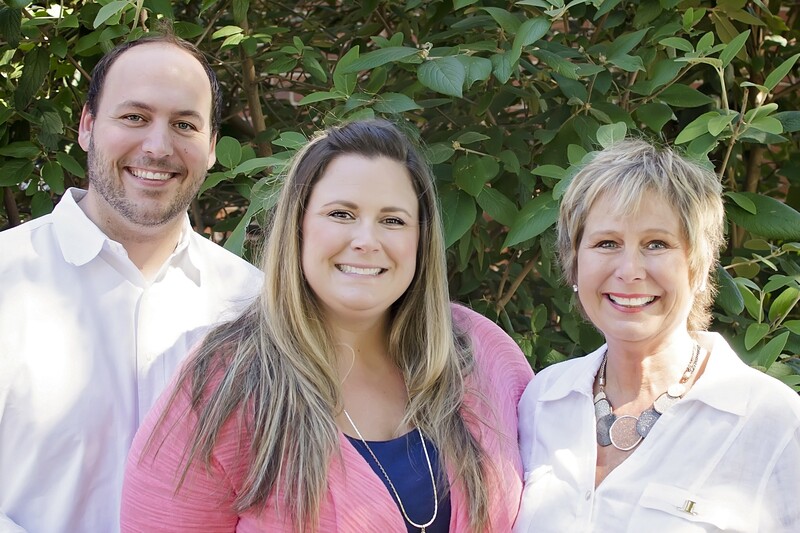 The mentor program and the ability to work with peers through the tools given to CSP® graduates gave me the experience and knowledge needed to confidently launch my own business. In the last 5 years, we have incorporated, we launched a rental company, we more than doubled our warehouse/office space, we have won occupied and vacant staging awards in Canada and, and more importantly, we have grown the business substantially. We continue to strive for excellence and growth. I want to thank Christine Rae, founder of the CSP® program and her team for the support that they constantly give to their graduates. Read Daniela’s article about her staging success in the Czech Republic. “While I was on my way to our CSP training on November 3rd, I was pondered several things during my drive. Would I get my money’s worth out of this program? Had I made a huge mistake. Could this program really teach me something that I didn’t already know? I’ve just come up for air after our class work, hard day of staging, trip home and catch up from my real estate work. All I can say is that I was absolutely wowed by your instruction and the power of this course. I thank you from the bottom of my heart and I look forward to auditing with you again in San Diego in the future. I give you folks a 10! It was grueling and relentless, but I loved every minute of it. I’m excited and looking forward to expanding my staging business. You were worth every cent! “The first house I staged sold over asking last night!! Put on the market at $339K and sold 9 days later for 400K! The happiness I feel is so indescribable!! 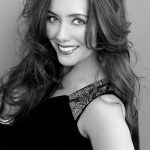 I just want to thank you so much for BEING CHRISTINE RAE! I don’t think I could ever have done this without your guidance and amazing program! CAN’T WAIT FOR MORE PROJECTS! The real estate agent wants to work with me too !! WOOHOO! Whew Hoo! What a fantastic class. Because of my research on which Professional Staging certification to receive I knew that your in class and hands on training would be dynamic and top notch, but I was not quite prepared for all of the in-depth business oriented information, as well as the professional and life experience tips, that you provided for launching a successful Staging career! And what an exciting team experience when staging the property in Oakville. A Thanksgiving Day I will never forget! Christine, it was such a pleasure meeting you and I was thrilled to have had you as my training guru! Your story of how you started your journey into this profession is one I can truly connect with and will be an inspiration for me fulfill my dreams and follow my passion…..I am a bumblebee! Here’s to the future as a CSP®. Thank you and I look forward to training with you again! I wanted to send Christine Rae (CSP) a testimonial. I had so many thoughts to share about taking the course ten years ago and how things have progressed through today. Yet when viewing the CSP® website all my thoughts were on the site!!! 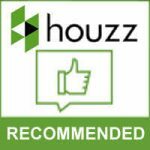 The website is loaded with valuable information and answers therefore this testimonial will be more about my thoughts on Staging, Training, Professionalism and Certification. 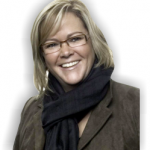 “Christine, thank you for providing such an amazing experience through your CSP® Course and for the opportunity to receive such great education of the staging and real estate marketing industry. I am truly honoured to have met you and have you as my trainer as you have been so proficient in your teachings and making sure that we were able to understand the material. You are a great inspiration to all that are looking to build their staging business and or make a career change. 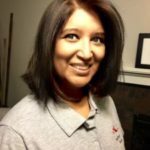 I had inquired about your course over a year ago and did not follow up as I am a single mom and did not have the time and schedule needed to commit to the learning process. Knowing what I know now, I regret that I did not take the course sooner as it has given me the motivation to finally pursue staging professionally. I have been in sales for 15 years and have studied Fashion Design and Technology through post secondary education. Through your Fast Track package and the tools and information that you have provided, I am confident that I will be able to take my sales experience and design skills to a whole new level and industry. I look forward to my one on one sessions with you as doing so will enhance my knowledge and provide the guidance needed to ensure that I am on the right path to setting up my business to be in the best position possible. 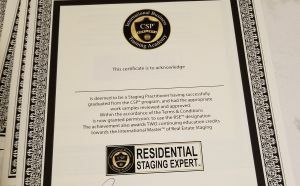 Becoming a Certified Staging Professional® and the ongoing access to the educational tools is the stepping stone to the ladder to my success and I am very excited for the future of my business. A special thank you to the CSP Support Staff who were so gracious and helpful in making sure or needs were met and supporting us throughout the training process. I would be extremely likely to recommend this program, -my rating of the program is a 10 out of 10! Combined with the Modules, Webinars, and self-study ahead of time….this three day program puts it all together. The on-going support is amazing too! The fact that we can return to class for refreshers, have on-going Webinars, makes a new CSP feel very supported! The included web-page is a great marketing tool, the Staging Magazine, the Room Ready Handbooks, the Portfolio’s and all the other CSP branded business items, makes it so much easier to start a business, and look professional as well! As with any job, and especially running your own business, there is always on-going learning, and I love the fact that there are more Webinars to come. I plan on taking more classes, earn more credits, and earn the “Masters”, in the next two years. If it already doesn’t sound like it, let me say…I am very excited about my new business, and appreciate all the support for the training centre! A few months ago I took another Home Staging Certification program. I learned very little, have since received no support and was not effectively taught everything about the industry and how to run a staging business. Completion of that program left me confused and floundering. I was not prepared to start my business with any sense of confidence. I decided to search a bit more extensively to find another Home Staging certification course. I committed to taking the three day extensive course offered by CSP in NYC with Nairn Friemann. I chose to take this course because Nairn is one of the top stagers in the area. If you are going to learn a new skill, might as well learn from the best! Furthermore, they offer a hands-on experience the third day of the class, something that is not offered by most other programs. I feel strongly that if you want to learn and be creative, you need to do this in person. An on-line course, in a creative industry, is just not going to cut it. The class was absolutely unbelievable. I learned so much, not just about the creative facets of Staging, but also the business aspect of this industry. I learned how to do a consultation, how to write a proposal and how to market a staging business. It was hard work, but well worth the investment of my time and money. I would highly recommend the CSP program to anyone who is SERIOUS about starting a Home Staging company. It is a best and most thorough program offered. Several weeks ago I had the pleasure of being a trainee in CSP’s intensive three-day staging training workshop with Nairn Friemann in New York City. Being an interior designer for 37 years, and practicing in both the residential and commercial areas, it is usually me who plays “teacher” rather than student. I must confess that I have more often than not been bored and disappointed in such events. My usual “M.O.” is to make excuses and leave early. But Nairn’s class was a very different experience. 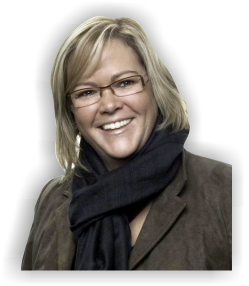 She was a serious, committed, engaging teacher, who clearly is at the top of her game in the Staging industry. She exhibited interest in each of her students, and gave individual guidance. I took prolific notes, and soon realized how much I could learn from her. She has my full respect, appreciation, and admiration. I had heard great things about the organization by alumni as well as have had great discussions and assistance from Liz and Linda. They have always been there to answer any and all my questions, they are polite and super efficient. I enjoyed having Jackson West as the Trainer for our sessions. He was dynamic, hands on and kept the group focused. He presented the materials well and ensured that questions were answered and that the group understood at all times what he was trying to get across. I enjoyed his business style and his unique values and views into the staging business. Thank you again Jackson for inspiring all of us for 3 days. 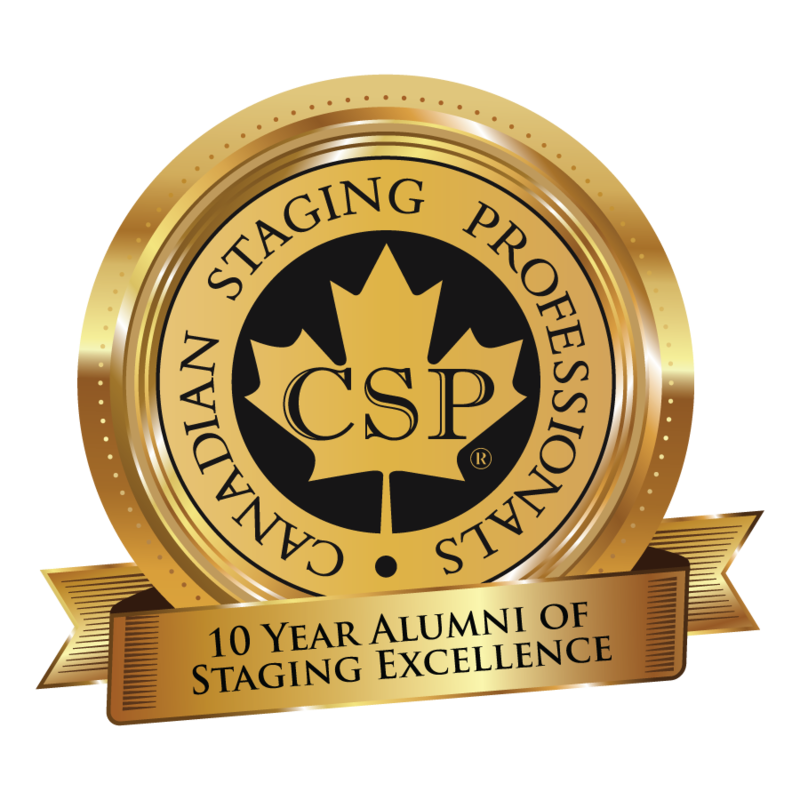 Last year I enrolled in a staging program which was very widely advertised and cost a little less than the CSP® 3 Day Course. You know that saying “You get what you pay for” ? Well I graduated from that program still feeling that I needed more information – in fact, a lot more, actually. So I enrolled in the 3 Day CSP® workshop in Toronto. It was so informative, so comprehensive and so much fun!!!! This is the program eveyone should be considering, when thinking about about becoming a Stager. 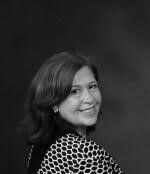 I am new to the Home Staging business. 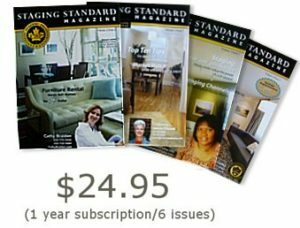 I had originally taken another Home Staging course and received their certification. However, my experience was very disappointing; my interaction with their staff was unsatisfactory, I was unable to communicate directly with a trainer and the course was limited. Follow-up and mentorship was non-existent. I really felt like I was adrift. 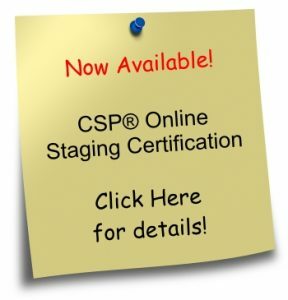 After receiving my certification from this other company, I started to do some research on the Home Staging training offerings and decided that I wanted to be associated with CSP®. The CSP® staff I spoke to were extremely informative, helpful and responsive. I concluded that the CSP® training program seemed more interactive and inclusive. My instincts were correct! I have just completed the 3-day program and my experience couldn’t be more different. I have to first give a big “bravo” to our instructor. My CSP trainer made the whole 3-step staging process come to life. The in-class course content was jam-packed with information, from how to run our business to the detailed aspects of Home Staging. Day 3 – the Home Staging day, brought it all together and turned the theory we learned into a real and practical experience. Thanks to the CSP® training program and my CSP trainer’s high energy, enthusiasm and knowledge, I now feel more prepared to proceed with my business, than I ever imagined, and I know that there’s support along the way. I’m looking forward to having the designation of CSP® and displaying the CSP® logo, and feel certain that my association with CSP® will bring my business the respect and credibility I want.